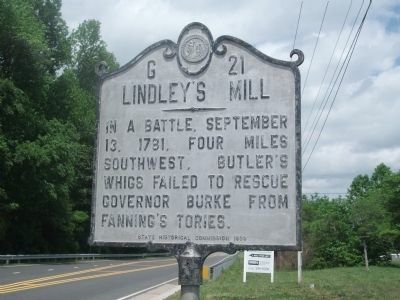 The Battle of Lindley's Mill on 13 Sept. 1781 was the largest engagement of North Carolina's so-called Tory War, a prolonged civil conflict following Lord Charles Cornwallis's invasion of the state during the American Revolution. After Loyalist David Fanning's surprising victory on 1 September over superior forces at Bettis's Bridge, the Loyalists were encouraged to rally in large numbers. Fanning, a leader of the Loyalist militia, had received approval from Maj. James H. Craig, the British commander at Wilmington, for a raid on the state capital, then located at Hillsborough. Fanning rendezvoused with troops commanded by Cols. Archibald McDugald of Cumberland County and Hector McNeil of Bladen County; the combined command totaled 1,200 men. The Whigs were led to believe that the Loyalists would attack Gen. John Butler's militia camp on Deep River. Instead, Fanning's army was able to enter Hillsborough undetected in the foggy dawn of 12 September and, following a brief skirmish, quickly secured the town, capturing over 200 prisoners, including Governor Thomas Burke. While plundering the state capital, Fanning's men opened its liquor stores, but by noon the long, somewhat unruly column left Hillsborough on the Cape Fear road bound for Wilmington. Receiving news of the disaster at Hillsborough, Butler rode immediately to intercept the Loyalist force where the Wilmington road crossed Cane Creek at the ford at Lindley's Mill in present-day southern Alamance County. On a plateau overlooking Stafford's Branch, Butler and Col. Robert Mebane laid an ambush to stop the Loyalists and possibly recover the prisoners. On the morning of 13 September, as the unsuspecting vanguard of the straggling Loyalists crossed the branch, a volley tore into their ranks, instantly killing McNeil and pinning down Capt. Archibald McKay's company of Highlanders. After securing the prisoners in the rear at Spring Friends Meetinghouse, Fanning rode forward to organize a flanking attack on the Whig position. Under assault from both front and rear, the Whigs stubbornly held their ground for several hours but were finally driven from the field. When he was seriously wounded in the arm late in the battle, Fanning gave the command to McDugald, who safely reached Wilmington with the prisoners. The killed and wounded, more than 250 men on both sides, were buried and cared for by Quakers in the surrounding community. The hard-fought battle was the bloodiest of the war in North Carolina, with more casualties for the numbers engaged than at the Battle of Guilford Courthouse. The raid on Hillsborough and the subsequent battle proved to be a turning point. The Loyalists expected the Whigs to succumb to this double blow, but the effect was quite the opposite: incensed by the audacity of the raid and the loss of the battle, the Whigs redoubled their efforts to suppress the Loyalists and win the war. Lindley S. Butler, ed., The Narrative of Colonel David Fanning (1981). Algie I. Newlin, The Battle of Lindley's Mill (1975). Marker at Lindley's Mill. Image courtesy of Historical Marker Database. Available from http://www.hmdb.org/marker.asp?marker=30270 (accessed May 14, 2012). 1 January 2006 | Butler, Lindley S.